Justin and I started out our international carry-on only travel journey with fairly large bags that just fit the carry-on limitation guidelines. For me, that meant my 44L backpacking backpack and for Justin something about the same. After a couple of trips though we realized we were bringing extra stuff when we traveled that we didn't end up using, like extra clothes we never wore. So, a couple of years ago when we went to Asia for two weeks we decided to do something a little drastic and cut our luggage size in half. Justin transitioned to a day hike type backpack and I decided to pack all my stuff, including my camera, into my 15L camera backpack (the blue backpack in the photos below). We were stoked when we actually pulled it off, but then again we were traveling in warm locales which means you can pack less and your clothes aren't as bulky. We wondered if we'd be able to do the same thing if we traveled somewhere cold. Well, this February we had the chance to find out when we traveled to Spain and Portugal. We weren't very hopeful but after a few packing practice runs we realized it was possible to pack in the exact same bags we'd taken to Asia. And yes, I realize that packing for Spain and Portugal in February is not the same as packing for Russia in February. Regardless, having traveled internationally multiple times now to places with various kinds of weather with just carry-on luggage, we've learned some tricks we thought we'd share. 1. Select Your Luggage First - I used to start the packing process with a pile of things I wanted to take and then select luggage accordingly. Now I do the process in reverse - start with a carry-on sized piece of luggage and then select only the items I know will fit in it. 2. Roll Your Clothes - We've found that rolling our clothes instead of folding them allows us to pack them in tighter and fill ever little nook and cranny. My clothes for our Spain and Portugal trip are rolled up inside the blue stuff sack in the photo below. I also placed my camera in the blue stuff sack and used the clothes as padding. My socks and underthings are in the orange stuff sack. 3. Make It All Match - Making sure everything you pack goes together is the best way to have maximum impact with the least amount of things. Sounds obvious but I can't tell you how many times in the past I've packed shoes or items of clothing that are stand alone pieces or only match with a few other things. Nowadays when I pack I make sure all my tops and bottoms can be mixed and matched and my shoes (usually a single pair) go with everything. 4. Travel in Your Bulkiest Clothes - This one is especially important if you're traveling somewhere with cool weather and need things like sweaters and jackets. The outfit laid out above is what I wore on all our flights to, from, and between Spain and Portugal: my jacket, thickest sweater, thickest leggings, and boots. 5. Avoid Duplicates: This one applies more to traveling with someone else. When Justin and I travel together, we think about what we can share and make sure to just bring one of that item. For example, only one tube of toothpaste, one outlet adapter, one towel (we use the brand PackTowel which makes awesome thin yet super absorbent towels - it's that folded blue cloth under my passport a few photos up), sometimes just one stick of deodorant etc. 6. 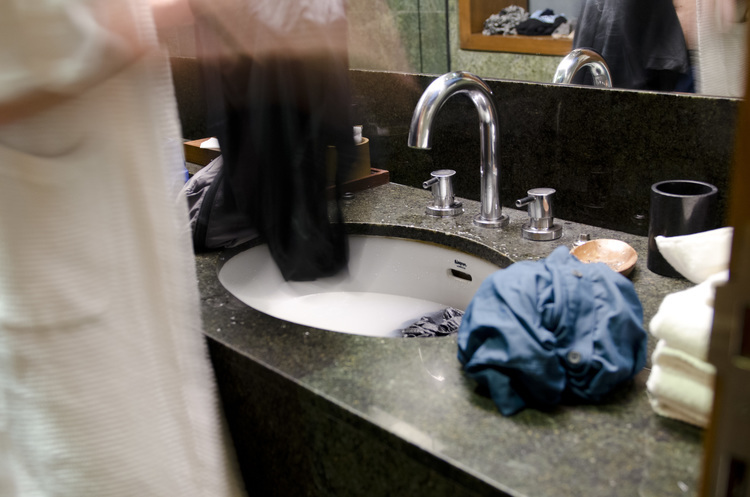 Do Laundry: If you're willing to wash clothes while you travel, you can get by with way less. Sometimes, depending on where we're traveling, we'll pay to have a load of laundry done because it's so affordable, but most of the time we do it ourselves in the sink or shower of whatever place we're staying and then hang the clothes around the room to air dry. Washing clothes in the shower while I'm showering is a personal favorite. If you're planning to wash your own clothes, taking things that are lightweight and will air dry overnight is a definite plus, but if you have enough time to let things dry you can obviously wash anything. 7. Research Your Lodging: We like staying at hostels when we travel, but some hostels don't provide linens (rare these days but we've still seen it here and there) so you need to do research in advance. Unless you think you'll be warm enough sleeping in a sleeping bag liner or a single top sheet (or just laying on a mattress with no linens at all) then trying to pack your own linens and stick with just a carry-on bag is nigh to impossible. Another thing to think about is whether your lodging provides soap and shampoo. If it's a standard hotel then probably yes, but if it's a hostel, homestay, or something similar then maybe not and you might need to calculate that into your packing space. 8. Purchase Items While Traveling: Purchasing some items during your trip can save you a lot of space and even money if it allows you to travel with just a carry-on and avoid paying baggage fees (there are a lot of budget airlines like AirAsia and Ryan Air that charge a ton for any luggage you take that's not carry-on). Of course, you've got to be smart with this one. We're not suggesting that you arrive somewhere and buy all your clothes or anything crazy like that. Examples of things we've chosen to purchase while traveling versus packing are shampoo, sunscreen, and umbrellas which we either used up or gifted to others at the end of our trip. Purchasing things when you arrive somewhere can also help you get past the whole 3.4 fluid ounces in your carry-on thing. Last time I mentioned on social media that we traveled internationally with just carry-on luggage, I received some requests that I post my packing list. As such, here's what I took on our trip to Spain and Portugal. It's a cooler weather packing list but when we go somewhere warm I take all the same things except I swap the cool weather clothes for a pair of shorts, a couple of skirts, a few t-shirts and tank tops, and a couple of swimsuits.